On Saturday, May 12, 2018, hundreds of singers and invited choirs from all around the region will join forces in "Singing Together For Peace", an uplifting intergenerational festival of gospel and folk music at Yale's magnificent Woolsey Hall! Featured groups will include GMChorale & Vocal Alchemy, Saecula Community Gospel Choir, Elm City Girls' Choir, United Girls' Choir, and Saecula Singers. Also appearing on the program will be ensembles and/or choristers from Bristol Central High School, Cheshire Academy, Hopkins School, St. Peter's Episcopal Church in Cheshire, St. Paul's Episcopal Church in Wallingford, St. John's Episcopal Church in Bridgeport, St. Thomas Day School in New Haven, John Winthrop Middle School in Deep River, and other institutions. For participating singers, the day will begin with a friendly group warm-up at 9:30am followed by a toe-tapping gospel music masterclass led by the amazing Michael Whitney Brown! The culmination of the program will be an inspiring "song share"-style concert at 12:30pm featuring performances by several individual ensembles as well as a spectacular massed choir! 10:00am – 11:30am Massed Choir Rehearsal for Masterclass Participants: An uplifting and inclusive intergenerational workshop on gospel and folk music led by renowned singer / songwriter, Michael Whitney Brown. Participants will learn several songs, which they will perform during the 12:30pm concert as guests of the Saecula Community Gospel Choir. All are welcome – even those who may prefer just to observe! There is no expectation of prior choral experience or musical training, and participants will never be asked to sing by themselves unless they wish to do so. The only requirements are an open mind and a smile! 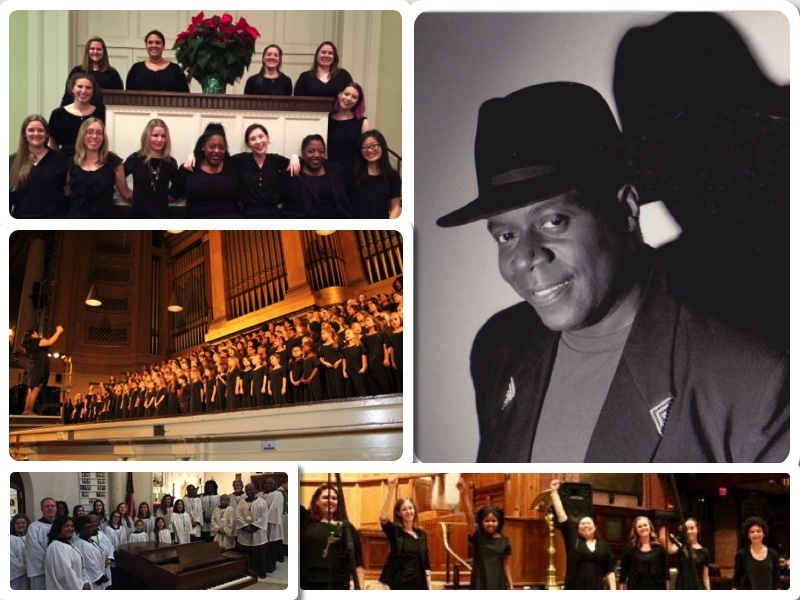 12:30pm – Concert: An inspiring "song share"-style performance featuring the Saecula Community Gospel Choir, Newark Boys Chorus, Elm City Girls' Choir, United Girls' Choir, Saecula Singers, GMChorale & Vocal Alchemy, and many other wonderful choral ensembles from around the region. You will surely leave feeling refreshed, invigorated, and energized! Guest Artist: Michael Whitney Brown is a singer/songwriter and conductor whose music career began at the age of four. He simply woke up one morning and started playing his family upright piano. He heard the music in his soul and just knew he could play it. Several years later, Brown has the privilege of working with students from around the globe. Gospel Music is his specialty as his roots were established in a Gospel Penecostal Church. Gospel singing, for many of his students was foreign. However, it wasn't long before they were excited and attracted to the spirit, sound, and rhythm of Gospel music. Beneficiary: Singing Together for Peace is being presented by the Saecula Choir Foundation in honor of the 25th Anniversary of the Elm City & United Girls' Choirs. The event is a fundraiser for Saecula Choir Foundation and the Sisters in Song Scholarship Fund, which provides financial support for girls and young women who would otherwise be unable to afford high-quality musical training. A Note about Tickets and Suggested Donations: Singing Together for Peace is a fundraiser, but the Saecula Choir Foundation is committed to ensuring that the event is accessible to all. Therefore, tickets are being made available on a "pay what you can" basis. If you wish to obtain a ticket but the suggested donation amount represents a financial hardship, please feel free to select one of the "custom donation" ticket options and contribute whatever amount is feasible for you. If, on the other hand, you are able to offer extra support to the Sisters in Song Scholarship Fund at this time, please consider purchasing a benefactor ticket and/or making an additional donation by entering any amount in the "Custom Payment / Additional Donation" box on the order form above. Saecula Choir Foundation is a 501 (c) (3) nonprofit organization. All donations are tax deductible to the full extent of the law.